Kitchen renovation planning is an important stage of a kitchen renovation Sydney project, as the entire development of the project can depend to some degree on this initial stage. A kitchen is the heart of a home and it should reflect your lifestyle, having the look and feel you desire. If your kitchen doesn’t look like you want it to, then you will need a kitchen makeover that will give it the image you envisioned. Once decided you need to change the image of your kitchen, you should start planning for a Sydney kitchen renovation, and pay increased attention to the look and functionality you desire for your kitchen, and budget available for the project. To have a good result for a kitchen renovation in Sydney, you need a good design and things to consider are the looks, functionality and having appliances and spaces allocated where it would be easy and intuitive for you to find and work with while making the place look tidy and attractive. It is very important that you would consider these facts and inform the specialist about them before they start the design (if you didn’t already decide the design yourself), for it to be greatly successful. Now that you know how you want your kitchen to look like, you need to decide how much money you need and can spend on your project. 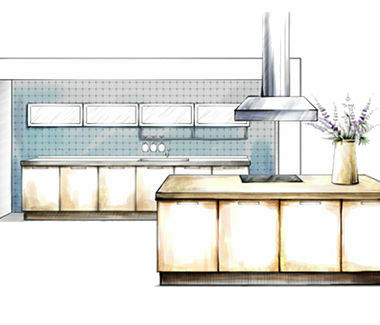 It is very important to have a budget already set for a project as this would help to choose the materials and design of your kitchen, being able to finish the project without you having to pay way more than you thought you will, not being able to finish the project because of insufficient budget or not having the quality you could have. When you create your budget, you need to consider all the items you want to include in your kitchen, the materials you want to have for your appliances, fixtures, and accessories, and research or get quotes from specialists for how much the renovation you want would cost. Once you have all those things taken into consideration, you have a budget that you can communicate to the chosen team that will do your renovation. You can also discuss your budget with the specialists if unsure and then decide on the final budget. Wondrous Kitchen & Bathroom offers professional kitchen renovation services in Sydney that can accommodate large or small projects, suiting different budgets. Our services range from a simple change of look to a full-scale redesign and renovation of a kitchen. Fully licensed and insured, we pride in providing complete customer satisfaction and superior service. Our experts will carry out all the work to the highest standards and latest and safest regulations. We are efficient in completing projects, offering the quality results you were looking for. Our team will work closely with our customers, making sure they will accommodate all the wants and needs of the customer and all within the established budget. Wondrous Kitchen & Bathroom also offers simple appliance changes that can greatly improve the image or functionality of your kitchen. If you don’t need a major renovation project but only changing the image or a kitchen update, we can also help you accomplish that. We have design, supply and install or installations only services available so whatever your project and budget, contact us at 0416 565 455 or 1800 779 603 for more information and FREE quotes, and let us transform your kitchen into your dream kitchen with our Kitchen Renovation Services in Sydney.